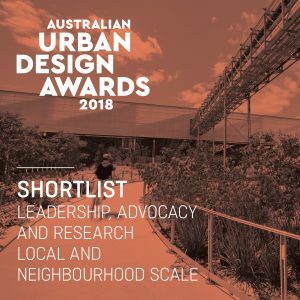 We were pleased to receive a Commendation at this year’s Australian Urban Design Awards, for the Leadership, Advocacy and Research (Local & Neighbourhood Scale) category, for our project, Living Knowledge Stream Design Guidance document. We congratulate all the winners across categories for their fine work and achievement. The Awards’ ceremony took place in Sydney on October 25. Syrinx has had the pleasure of collaborating with Elder Dr Noel Nannup and Jenny Hunter of sync7 to develop The Living Knowledge Stream design guidance document for Curtin University. The document is a groundbreaking strategic framework that integrates Traditional Ecological Knowledge (TEK) with contemporary ecological science and green/blue infrastructure.